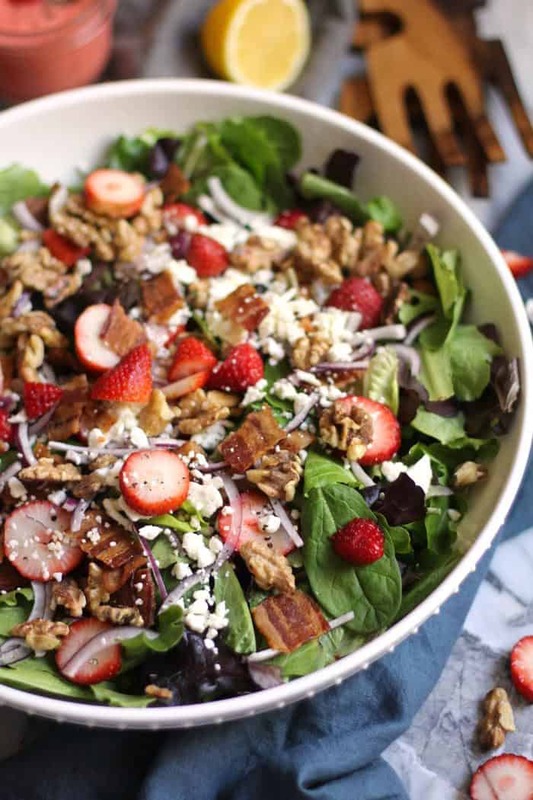 Bursting with strawberries in both the salad AND the dressing, this Strawberry Bacon Salad with Creamy Strawberry Dressing is a perfect summertime salad. This one’s a keeper. My family easily devoured this salad in one sitting. It was the perfect side to go with the Barbecue Baby Back Ribs we made. Josh was home for Spring Break and we ate big. He’s the kid that makes food requests when he comes home. Nothing makes this momma happier than to hear that one of my boys wants me to cook for him. Summertime fruit is something we look forward to all winter long. We get tired of our apples, oranges, and bananas, and it’s pretty fun to stock up on all the berries. Strawberries, blueberries, blackberries, raspberries. These are our favorites, and I’ve had more than one cashier ask me if I “juice”. Nope, we just REALLY like our berries. This is an “eat the rainbow” type of salad. The vibrant colors make you eat with your eyes first, as any great salad should. But most importantly, the taste is great. Here’s why. 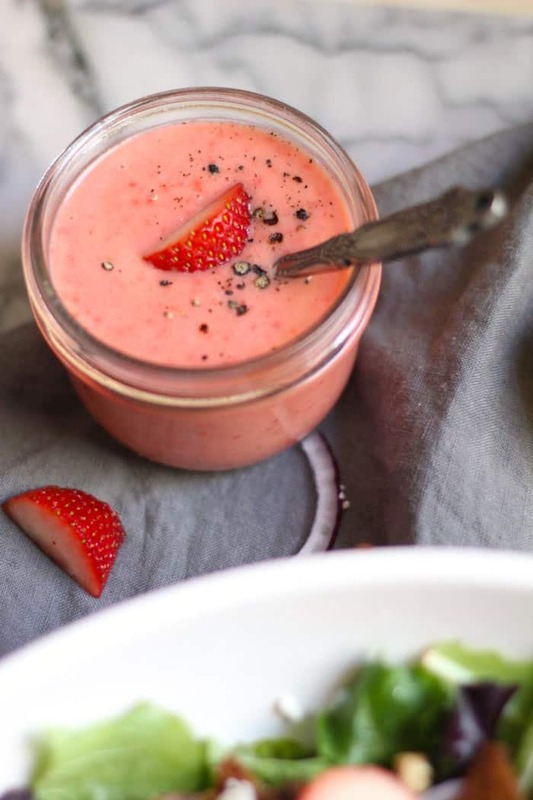 The sweet strawberries give the tangy dressing that perfect balance. That thing that makes you say, “oooh”. The salty bacon and feta give the salad fullness, as well as protein. Crunchy nuts are the other part of the equation, and toasting them brings out their full flavor. Just look at the color of the dressing. It’s super easy to make, and a real crowd pleaser too. 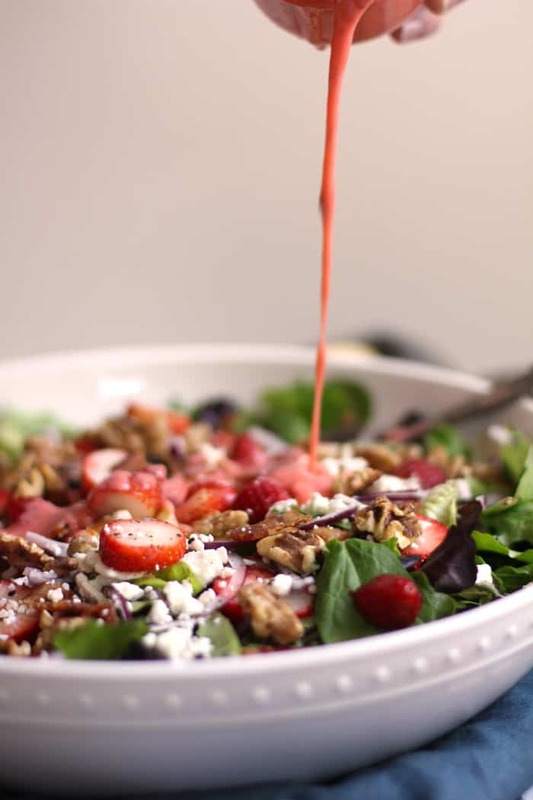 A colorful and tasty salad combining healthy greens, sliced strawberries, crumbled bacon, toasted walnuts, feta cheese, and a delicious strawberry dressing! 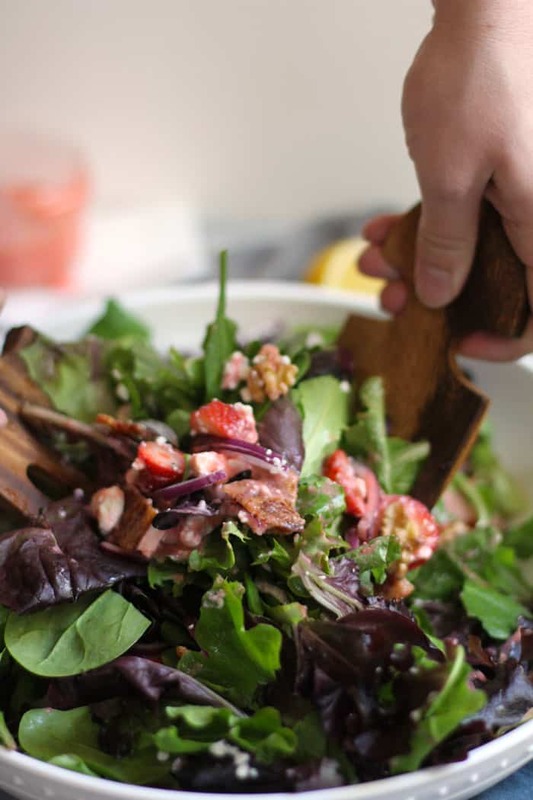 Mix the salad ingredients together in a large serving bowl. Puree the strawberries in a blender. Pour into a salad dressing shaker or a mason jar. Add remaining ingredients and shake well. 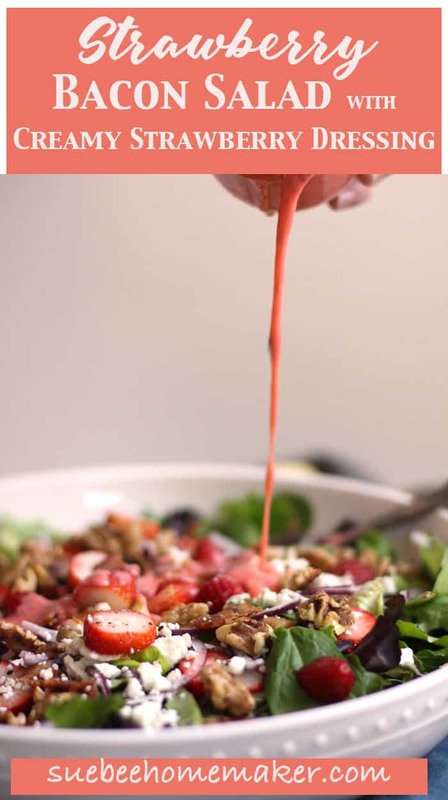 Drizzle the dressing over the salad before serving. Enjoy! 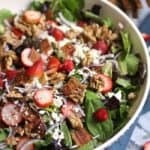 I made your Strawberry Bacon salad and the Creamy Strawberry Dressing!!! Absolutely delicious, our whole family loved it, it paired well with our marinated, grilled pork loin and fresh asparagus out of the garden! We were skeptical about the dressing but, ohhhhhh so yummy, glad we tried it! I even made a double batch and am storing it in a mason jar in the refridgerator so we could enjoy it through the week! Thank you Sue! To me, eating healthy is about finding the right combinations and this salad is awesome. So refreshing and healthy. It is hot in Texas and this is perfect to get your meal started.